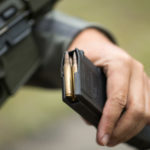 Proper and regular maintenance is essential for ensuring the long life of any and all mechanical devices, and guns along with gun accessories are no exception. Firearms need good lubrication and cleaning to ensure peak operational performance. 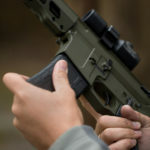 Regular maintenance does not mean that guns need to be disassembled to the last spring and screw in order to clean them. 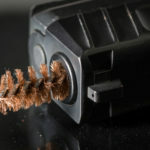 The few steps outlined below can help you clean your firearm quickly and easily. 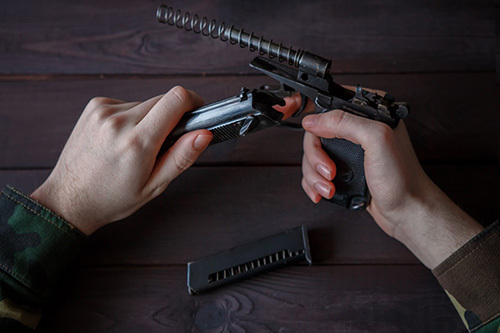 Before cleaning any firearm, you need to ensure that it is unloaded, and for that, you need to open the action first. It’s best practice to go through the instruction manual of your gun to get the specific instructions for the particular model. Make sure to remove the magazines or clips. 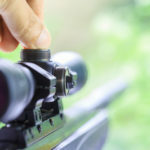 In the case of a rifle, you need to take out the bolt, and in case of a semi-automatic rifle, pistol, or shotgun, you need to open the action. Brush the bolt with a solvent to clean it, and then lightly lube the same after drying it thoroughly. Ensure that you brush the ejector and the extractor as well. After cleaning the bolt, set it aside, and work from the chamber or the breech end of the gun to run a cleaning rod attached with a bronze brush. Soak the bronze brush in gun solvent, and move it down the barrel and muzzle of the gun. You need to repeat the action if the barrel is extremely dirty. Allow the solvent to sit for about fifteen minutes. This lets the solvent soften the lead, jacket material, and powder fouling of the gun. Once the solvent soaks in, you may run the bronze brush soaked in solvent down the barrel of the gun. Run this many times to loosen the gunk. Some experts advice unscrewing the brush at the muzzle with each stroke, rather than pulling it back. If you are into professional target shooting the extra effort that you put in here can make a huge difference. However, for the average 0.22 LR rifle, this isn’t necessary. It is up to you to decide whether you need this step or not. After a few runs of the brush, say around ten, you can run a cloth patch down the bore of the gun to get rid of any excess carbon. Take care not to pull the patch of the gun back out. Take it off the rod and replace it with a clean one, then pull the rod back out of the chamber end of the gun. Repeat the steps again with some brush scrubbing thrown in. If you are trying to clean a hunting gun, running the cleaning brush for about twenty-five times should do the job.